There was this man that I used to know, whom I admired. One day we were talking about my kids. At this time we lived in Massachusetts and Shelby was a baby. "How old is your oldest?" he asked. "Four," I replied. "Oh yes, they won't be friends then." And I just nodded, as if he had said something wise. He did, after all, have four grown children of his own. So he should be an expert on this, right? And in the back of my mind I thought, "Well that's a shame, that they can't be friends because Mr. so-and-so said that it is so." But then something began to happen...Dalton LOVED this new little baby. Loved her so much. And she in turn loved him. And as she grew he would protect her, and play with her, and make her feel SO special, that one day when she asks me whom she should marry and I reply, "whoever you want" she responds with "I am going to ask Dalton if he will marry me."... And the older she gets, the more they become...FRIENDS! Can you believe it?! How can it be? Four years apart...and they still like each other! So this is yesterday (before it snowed and snowed and snowed). 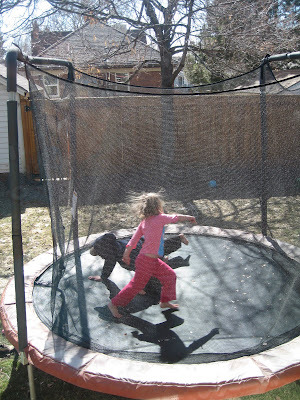 I looked out my bedroom window, and secretly snapped these pictures of the two little friends on our big trampoline. They were playing a game, laughing and running, and then they happily collapsed in to a pile- absorbing the warm March sun, together. Those are Garrett's burp cloths. And today I realized that he has outgrown them. There was a time when you had to be draped in at least two of these, while holding him, for fear of being drenched in mountains of spit up. There was a time when I couldn't wear black while holding him, because my shoulders would end up looking grey. And all of a sudden- he no longer needs them... I no longer need them. When did this happen? It couldn't have been over night... But now my baby boy is big; eating "big stuff" like beans, and strawberries, and cheese, and my chicken soup, and every other thing he can get his hands on. He hardly has time for bottles any more. They are just so "babyish"...And THIS is my curse. 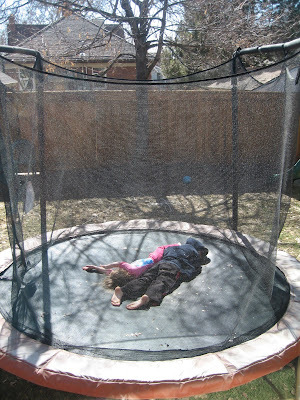 All my kids are this way: They are ready to take flight from an early age. Mothers will brag about their little ones who still cling to them at the age of four, or still want to be held all the time even though they are in pre-school. And then there are my little ones...especially this little guy; so curious, so much to see, so little time to do it in, "And mom, why would you want to hold me back?" And so at the age of 9 months, he is taking steps, ready to walk, WANTING to run...to the toys, to the cat, out the door, anywhere, everywhere! And then there's me, sometimes wishing that he still needed those burp cloths. And just as I think that thought today, just as I had snapped that picture (to remember that there was a time that he did need a burp cloth), he looks at me AND HE CLAPS (he has learned to do this recently). And so I watch him puff his little chest out, and clap with all his might, and instantly- I feel at peace. The hurried desire to stop the clock, to push back the hands of time...it left me. I can be happy in this moment. Happy that I had the great (sometimes hard, sometimes wondrous) nine months that led up to this point, and hopeful about the months and years ahead. It's OK for me to want to drink in all of his babyness before it melts in to the rest of his fast-moving life. I AM grateful that he is developing and progressing well. And so I clap right back at him... "Yeah for baby Garrett!" (and inside I think "Yeah for mommy") because to be honest, it's baby-steps for both of us. 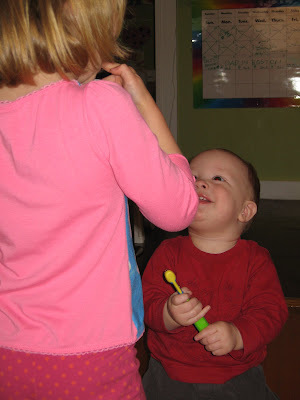 And as I put the burp cloths in to the growing pile of baby-stuff-to-be-given-away, I watch Shelby give Garrett a demo on how to brush his (now 6) teeth. He is drinking it all in...As am I.
Isnt it magical how our kids grow up so fast? One moment they're in diapers and the next they've figured out the lock on the fridge. Kids grow up too fast. He's such a cute little boy...and that many teeth already? Wow! Charlie is just now getting his 5th and 6th teeth - the front two...the ones on the side of the front two came in first, so at the moment he's a little vampire. Ha. I love that they are friends. I wondered about my kids too since they are 3 years and 8 months a part. So far Owen loves his baby brother. 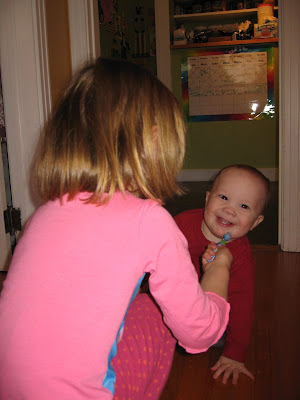 When we have to wipe his nose, which he ABHORS, Owen will jump into his defense and tell us to knock it off. He is his best friend through and through. If we ever forget to include Reid in anything, Owen is there to make sure we don't. BTW I love your burp cloths. Did you buy them or make them? 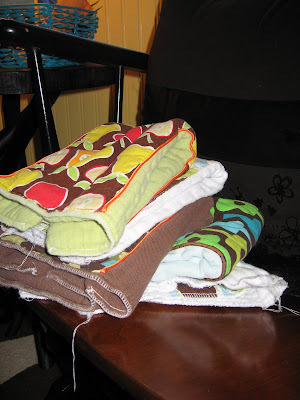 Delia, just say the word and the burp cloths are yours! I have so many and everyone I know is having girls. I did not make them, although it probably looks that way since there are pieces of thread hanging all over the place. I am sure SOMEONE hand made them...I just paid for them! And your big guy sounds just like ours. For sure your little ones will be buddies! Charlotte, can you believe it on the teeth! Dalton was the same way. All I can say is that it is a good thing i weaned him when I did or I would be a dead woman. SUP, it's great to get to know you through the blog world.